Sloe Gin is very popular, but I've made it in the past and it just lurks in my drinks cabinet and ends up getting thrown out. 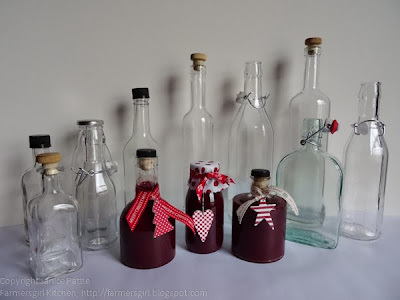 So this year I decided to make Sloe Cordial a non-alcoholic cordial that can be topped up either with alcohol i.e. Gin, Vodka, Prosecco, dry white wine or with non-alcholic mixers like tonic water, soda water or lemonade. I froze my sloes after picking, mainly because I didn't have time to make the cordial, but the freezing also helps break down the sloes and mimics the frost you are supposed to have had before picking them. I was rather pleased that I had because I was contacted by Pattesons Glass with the offer of some jars or bottles to review. I decided to go for the bottles and make some gifts for Christmas. Pattesons have a fantastic range of glass bottles and jars which are ideal for those of us obsessed with keen on preserving in all it's forms, they are also great for styling in food photography and I'm sure you will be seeing more of these bottles in future posts. Jars are not too difficult to get hold of, but a great range of interesting bottles like the ones in the photograph above are much less widely available. I have plans for some flavoured vinegar for the larger bottles. The only drawback with these bottles is that they are only available in fairly large quantities. You can order a sample set of three different bottles or jars for £10. If you want to order bottles, then you may wish to get together with a group of friends and share the bottles between you, as 50 is the minimum order. Pattesons also sell Le Parfait jars in smaller quantities which are ideal for preserving. 1. Bring the sloes, water and lemon juice to the boil and simmer for 5 minutes. 2. Break up the cooked sloes with a wooden spoon or potato masher, don't bother about the stones as they will be sieved out later. 3. Simmer for a further 10 minutes. 4. Pour the mixture through a sieve. If you want your cordial to be clear you should line your sieve with a muslin and don't push the pulp through. I didn't do that and although the cordial is perfectly fine it isn't clear. 5. Clean the pan and pour the juice back in, add the sugar and heat gently until the sugar has dissolved. 6. Bring to the boil an simmer for another 10 minutes. Cool and bottle in sterilised bottles. To drink, add 10 parts water to one part cordial. I received a range of glass bottles from Patteson's Glass, I was not paid for this review and all opinions are my own. Love the idea of Sloe cordial Janice. As a fan of sloe gin, this would be delicious I'm sure! Lovely idea and recipe too Janice I shall look forward very much to Santa bringing me a bottle, cheers! Lovely gift idea. I'll give it a try. 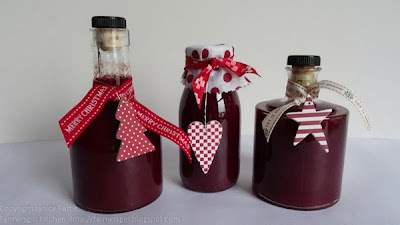 Your bottles look so pretty Janice and the colour of the sloe syrup is wonderful. Such a good idea to make this. Sadly I didn't get to pick any this year, so no sloe gin or even syrup for me. This is a must have!!! I made the cordial last night from sloes picked and frozen last autumn, and from a kilo I had a little over one litre of gorgeously deep coloured very fruity and strong cordial. Thank you Janice for sharing this receipe. Must try this can you substitute honey for the sugar, and how long will the sloe cordial keep? I'm not sure about with honey, but the batch I made was still good after a year, kept in a dark cupboard.